Today is the 50th day of my 100 Days Project, which means I am half way through. To celebrate . . . I figured a cocktail recipe was in order. As I mentioned in my Day 9: French 75 post, gin is my favorite spirit, and I figured I would look for a cocktail that would help use the leftover pomegranate molasses from my Day 46: Pomegranate Glazed Tempeh recipe. I found a recipe for a gin and pomegranate cocktail on the Fisher & Pykel: Our Kitchen blog . . . PERFECT!!! I invited a few friends and colleagues around to help me celebrate Day 50, and come up with a good name for the cocktail. To be honest, I thought “Gin and Pomegranate Cocktail” was a bit boring; The Pomgranade was born. The sweet and tart flavors of pomegranate molasses and lime make this cocktail very easy to drink, but the gin eventually catches up with you . . . BOOM!! If limes are out of season and ridiculously expensive, you can also use lime cordial, but then omit the sugar. If doing this substitution, I recommend Bickford’s Lime Juice Cordial, because it is not as overly sweet as some of them can be. 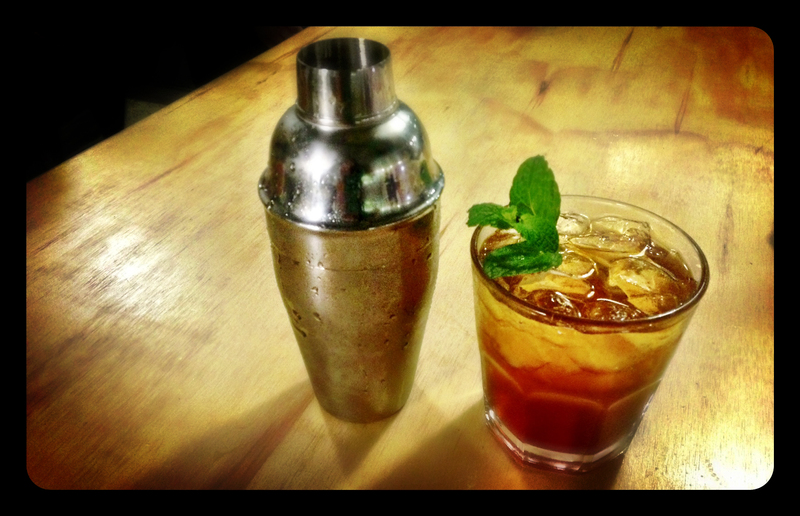 Combine all the ingredients in a cocktail shaker with ice, give it a good shake, pour over ice in a glass, and garnish with a spring of mint. Mmmm . . . there is nothing like curling up with a cup of tea or hot chocolate before bedtime. That is unless you combine the two!! When I found this recipe for Earl Grey Hot Chocolate on Fisher and Paykel’s Our Kitchen blog, it was one of those “why haven’t I thought of this before” moments. I have been in love with tea since I spent time in Australia in 1999-2000, and had some friends who were obsessed with the stuff. I have to admit that one of the highlights of a short trip I took to London in late 2000 was a trip to the main Twinings tea shop. Floor to ceiling shelves full of teas with the lovely aroma of all those tinctures filling the store and pouring out into the busy London street. I have no idea how people were passing by without coming in for a cup of tea, or at least a brief sniff of the tea perfumed air. As far as I am concerned adding chocolate to tea, can only be a winning combination. 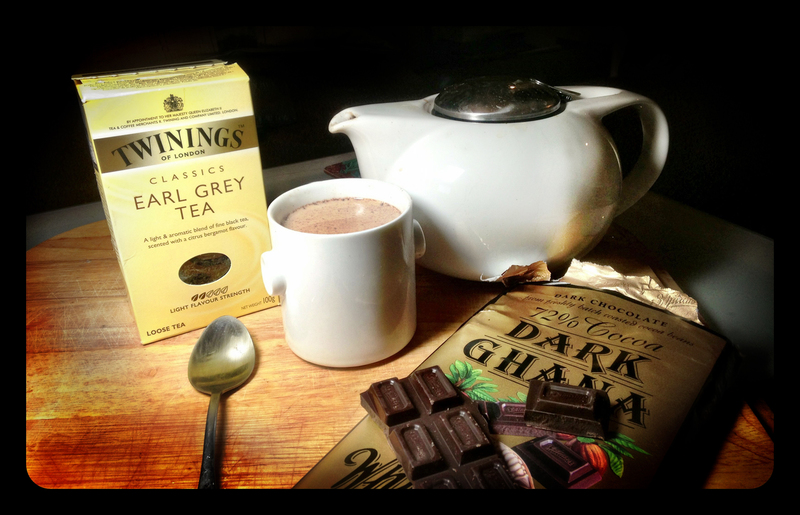 The Earl Grey gave the hot chocolate just that slight earthy, herby flavor and made a delicious night cap. This recipe can easily be made vegan by using soy, almond, or other non-dairy milk of your choice. If you are feeling a bit naughty, a shot of vanilla liquor, Frangelico, Baileys, or even a good quality whiskey would probably go quite nicely. Combine the milk and tea in a saucepan and gently heat without boiling. Continue heating for approximately 10 minutes. The milk will take on a light tea colour. Place 2 squares of chocolate into a heatproof glass; you could always put an extra one in. Pour the milk over the chocolate using a tea strainer to remove the tea leaves. Stir the the chocolate into the milk, and serve while still warm. Risi e Bisi in Italian literally translates to rice and peas. This is a classic Venetian (Venice, Italy) dish that was prepared only on the feast days decreed by the Doge (Venice’s ruler). These days this law no longer applies and you are allowed to prepare Risi e Bisi at any time, although it is best when fresh peas are available. 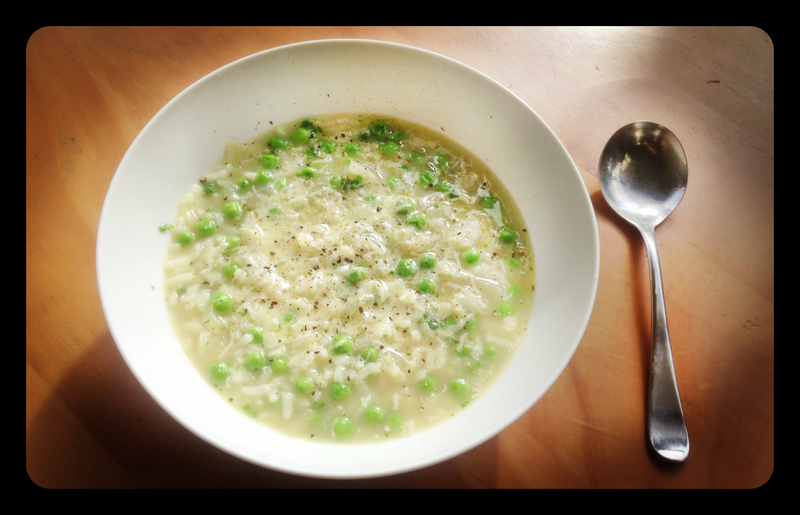 Even though this recipe uses Aborio rice, which typically is used for Risotto, Risi e Bisi is more like a soup. I found this soup recipe in a collection from The Moosewood Restaurant, in Ithaca, New York. The Moosewood, was one of the first fully vegetarian restaurants opened in the United States in the early 1970s, and it has been named one of the thirteen most influential restaurants of the 20th century by Bon Appetit magazine. The Moosewood Collective was also one of the first to publish a vegetarian cookbook for home use. “The Moosewood Cookbook” is a recipe book written by Mollie Katzen in 1977. It was hand-lettered, imaginatively illustrated by Katzen, featured a number of the recipes favored by the restaurant at the time, and quickly became a “must have” in many American homes. Recently, “The Moosewood Cookbook” was listed by the New York Times as one of the top ten bestselling cookbooks of all time, and is likely the most popular vegetarian cookbook in the world. Both “The Enchanted Broccoli Forest” and “The Vegetable Dishes I Can’t Live Without” are cookbooks written by Katzen that can be considered Sequels to “The Moosewood Cookbook”. When I lived in Rochester, NY for University, I often made the 1 1/2 road trip to Ithaca just to eat at The Moosewood. I do not think any project about vegetarian food would be complete without including at least one of their recipes. This recipe is incredibly simple and delicious; I could not stop myself from eating two large bowls for lunch. It is gluten free and can easily be made dairy free and vegan by substituting the butter, and leaving out the Parmesan. Warm the butter and olive oil in a medium pot until the butter has completely melted. Add the onions and sauté on medium-high heat for about 10 minutes. The add the stock and salt and turn up the heat to high bringing the stock to a boil. Stir in the rice, and lower the temperature to a simmer, cover, and cook for 20 to 20 minutes, until the rice is tender. Add the peas and cook for another 2 to 3minutes before stirring in 1/2 cup of the parmesan cheese and the parsley. Add additional salt and pepper to taste. Serve immediately, topped with remaining parmesan. Seriously though, I had bought the pomegranate molasses ages ago for a particular recipe I ended up not liking very much, and have been looking for an opportunity to use it ever since. Hence my excitement at finding the Pomegranate Glazed Eggplant with Tempeh recipe in Heidi Swanson’s “Super Natural Every Day” cookbook. 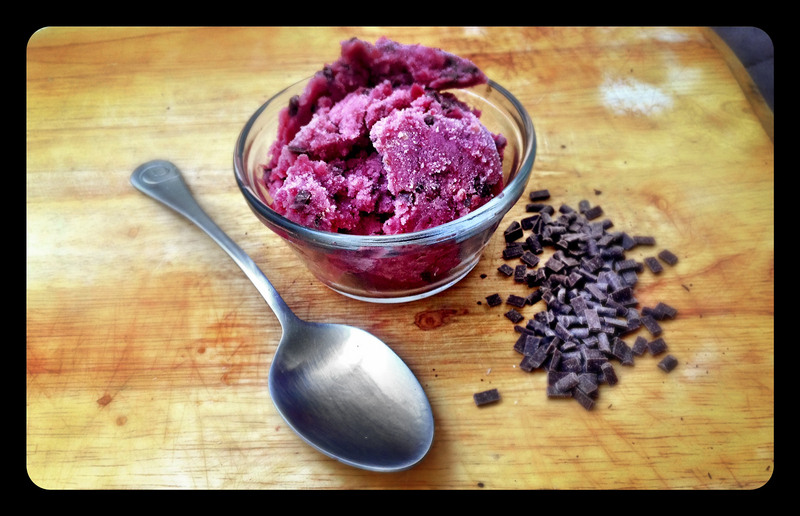 Pomegranate is one of those flavors that it so unusual, just the right mix of sweet and tart. It is a fruit that has been cultivated in the Middle East since ancient times, and has been mentioned in many ancient texts including the Old Testament. Pomegranates are used in cooking, baking, juices, smoothies and alcoholic beverages, such as martinis and wine, and can give you up to 12% of your daily required intake of vitamin C. You can usually find pomegranate molasses at a middle eastern shop, or sometimes at your local natural food type store. Tempeh, is a kind of patty made of highly nutritious fermented soybeans. 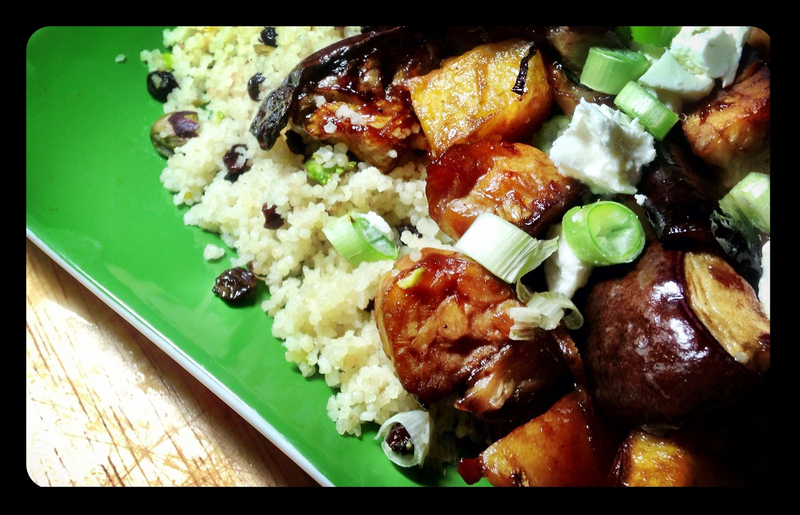 To learn more about the this food you can read my Day 18 – Teriyaki Tempeh Bowl post. This recipe is Vegan, gluten and dairy free, if you leave off the feta. I served it over a bed of couscous made with currants, green/spring onions, and dry roasted pistachio nuts, but realistically it would go well with almost any grain or pulse: rice, wild rice, Israeli couscous, bulger, quinoa, etc . . .
Preheat the oven to 180 C or 350 F, with the rack int he middle of the oven. In a large bowl combine the cubed, eggplant, tempeh, and squash. Prepare the glaze by sprinkling the salt over the smashed garlic, and then turning the garlic into a paste, either in a mortar and pestle or by continuously chopping and smashing the garlic with the flat of your knife. Combine the garlic paste in a small bowl with the chili flakes and pomegranate molasses. Whisk in the olive oil. Then drizzle 3/4 of the glaze over the ingredients in the large bowl. Toss well and transfer them to a rimmed baking sheet trying to arrange the ingredient sin a single layer. Bake for 45-60 minutes until the eggplant and squash are soft and starting to caramelize. About 35 minutes into baking give the ingredients a good toss on the pan. Once out of the oven drizzle with the remaining glaze, and sprinkle with the feta and fresh coriander/cilantro. Serve warm with couscous or your grain of choice. Baked apples make me think of Grandma and Grandpa Mills . . . Growing up, we had dinner with my grandparents every Sunday. There was a cafeteria style restaurant they liked to go to, and everyone’s favorite from the desert bar was the baked apple. Those baked apples were not nearly as fancy as this Baked Apple Stuffed with Candied Ginger and Almonds recipe from Jerry James Stone and Treehugger’s Green Wine Guide, but it still makes those memories float to the surface. I had a friend over last night for a Sunday night game of intense competitive Scrabble, which was a game I always played with with my Grandmother as well. Maybe that is why this recipe seemed like the perfect fit. Unfortunately, I got a bit distracted when reducing the syrup and it turned into more of a caramel that almost candied the baked apples, but it was still quite delicious, and I supplemented it with warm maple syrup to make sure the apple was not too dry. 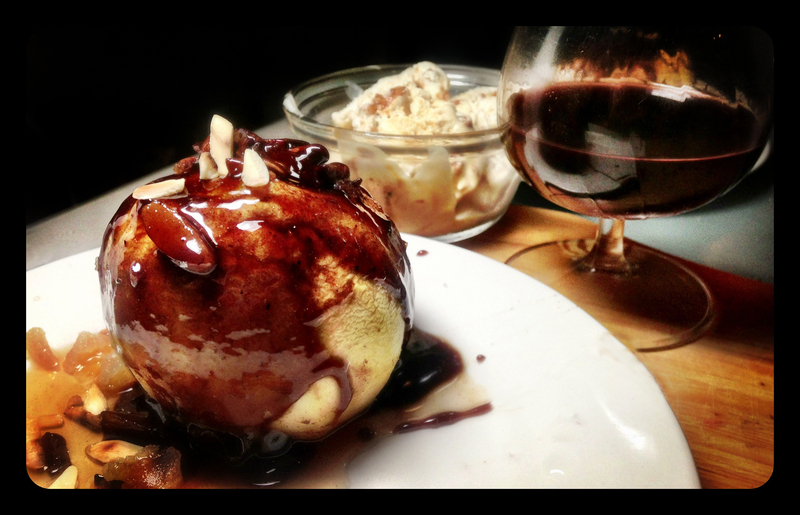 I served the the baked apples with maple walnut ice cream and a small glass of port. The three made quite a good winter desert combination and an excellent Scrabble treat!! You can easily substitute the honey for another unrefined sweetener for Vegan alternative . . . Combine brown sugar, vanilla and honey and mix well. Then mix in the ginger, almonds, cinnamon, clove and lemon zest, and set to one side. Core each apple; be careful to remove all of the stem and seeds. If need be, trim the apple bottoms so that they sit steadily on a flat surface. Place the apples upright in a baking dish, and spoon the filling into hollow of each apple . Fill the baking dish with enough water to form a 20 mm or 1/2-inch pool around the apples. Bake for 1 hour and 15 minutes or until the apples are tender. Transfer the apples to a serving plate with a spatula. Pour the reaming liquid from the baking dish into a small saucepan, and cook over a medium-high heat until it becomes syrupy, about 15 minutes. This is where you need to make sure not to reduce it too long that it becomes a caramel. Drizzle the syrup over the top of each apple, and sprinkle some additional almonds and candied ginger on top. Her is another great slow cooker recipe for you my Herbivores . . . The best thing about slow cookers is how you can pop everything into the insert the night before or in the morning, the slow cooker does all the work, and you get to eat the yummy results. 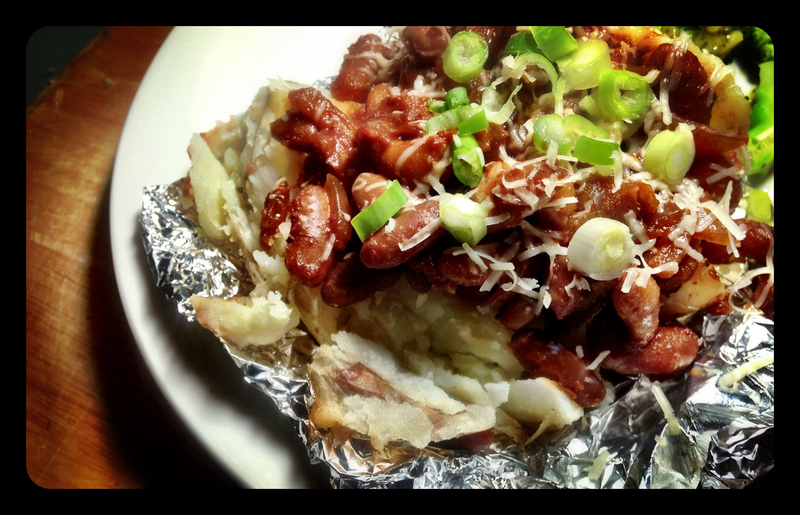 This recipe for slow cooked barbecue baked beans, from Skinny Ms, is not exception. I love the smokey maple flavor of a good BBQ sauce, and unfortunately, until recently, that can be hard to find here in New Zealand. I used to make the trip out to Martha’s Backyard, the American Store in Mt. Wellington, just for BBQ sauce. Luckily now some of the fancier food stores like Nosh and Farro are bringing BBQ sauce in from the US. Even one of my favorite brands, Kansas City Cowtown BBQ Sauce. I got so excited when I saw this at a friend’s house that she bought me a bottle the next time she came over for dinner. A friend that brings good BBQ sauce is a good friend indeed!! The Bonz Kajun Kitchen in Elliott Stables makes great locally made BBQ sauce that they bottle and sell, but you have to ask nicely for a vegetarian version, because he will normally put pig fat drippings in his sauce otherwise. The thing that makes BBQ sauce so good is the combination of smokey, savoury, spicy, and sweet all perfectly balanced for optimal enjoyment. When slow cooked with these beans, it makes a great side dish or can easily be turned into a main, like I did, by spooning the beans over a baked potato and adding a bit of spring onion/green onion and cheese. A Kiwi favorite is baked beans on toast, and this recipe can be be used to make a great version of that dish as well. Add a fried egg on top, and you got a yummy savoury breakfast!! If you do not have access to a good BBQ sauce, you can easily make your own with the recipe included below. Add all ingredients for the BBQ beans into the slow-cooker. For the unrefined sweetener, I used a combination of golden syrup and molasses, but any of the other options will do). Cover, turn to low and cook 6-8 hours. It is as simple at that!! In a medium sauce pan add canola oil, turn to medium-low heat and saute onion and garlic until tender, about 5 minutes. Add the remaining barbecue sauce ingredients, stir and simmer until sauce has thickened, about 30 minutes. Viola! !